I am a member of the MIT/NASA team developing the MOXIE (Mars OXygen In-situ resource utilization Experiment) payload that will be a passenger on the Mars 2020 rover. The goal of the experiment is to develop and demonstrate technology required to manufacture oxygen from the carbon dioxide in the Martian atmosphere. This technology will enable the human exploration on Mars by creating oxygen needed to fuel the rockets to return astronauts to Earth. Without such technology, a manned mission to Mars may be economically infeasible, unless the explorers plan on never returning home. *Note: This is an unofficial page on the MOXIE project. The information here is a collection of what is publically available from various sources. Get the latest updates from the official MOXIE page HERE​! Meyen, F. "System Modeling, Design, and Control of the Mars Oxygen In-Situ Resource Utilization Experiment (MOXIE) and Implications for Atmospheric ISRU Processing Plants" Doctor of Philosophy Thesis. Massachusetts Institute of Technology Department of Aeronautics and Astronautics. May, 2017. MOXIE being lowered into the Mars 2020 Rover. Image Credit JPL. ​Meyen, F., Krishnamurthy, A., Hoffman, J. A. "STPA Analysis of the Mars Oxygen Insitu Resource Utilization Experiment (MOXIE)" 2018 IEEE Aerospace Conference. Big Sky, Montana. McClean, J. B., & Pike, W. T. (2017, June). Estimation of the Saltated Particle Flux at the Mars 2020 In-Situ Resource Utilization Experiment (MOXIE) Inlet. In Dust in the Atmosphere of Mars and Its Impact on Human Exploration (Vol. 1966). McClean, J. B., Merrison, J. P., Iversen, J. J., Madsen, M. B., Araghi, K., Meyen, F., ... & Voecks, G. (2017, March). Testing the Mars 2020 Oxygen In-Situ Resource Utilization Experiment (MOXIE) HEPA Filter and Scroll Pump in Simulated Mars Conditions. In Lunar and Planetary Science Conference (Vol. 48). Hecht, M. H., Hoffman, J. A., & Team, M. (2016, October). 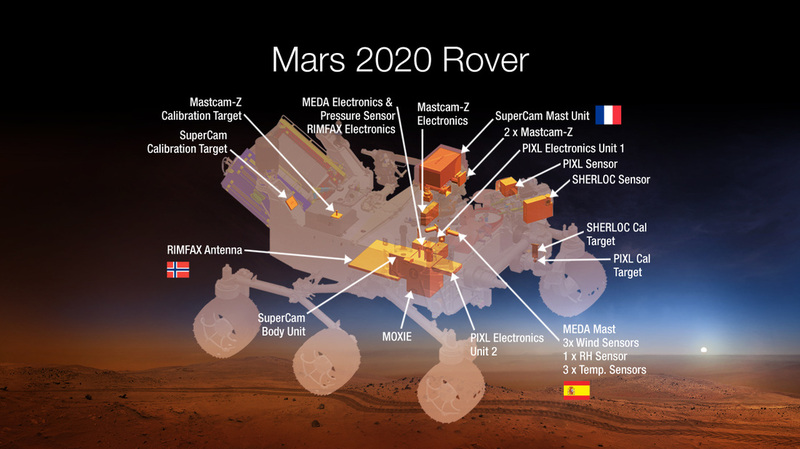 The Mars Oxygen ISRU Experiment (MOXIE) on the Mars 2020 Rover. In 3rd International Workshop on Instrumentation for Planetary Mission (Vol. 1980). Hartvigsen, J., Elangovan, S., & Elwell, J. (2016). Martian Oxygen: Creating Breathable Air with Engineered Ceramics. Ceramic Industry, 10-12. ​Rapp, D., Hoffman, J. A., Meyen, F., & Hecht, M. H. (2015). 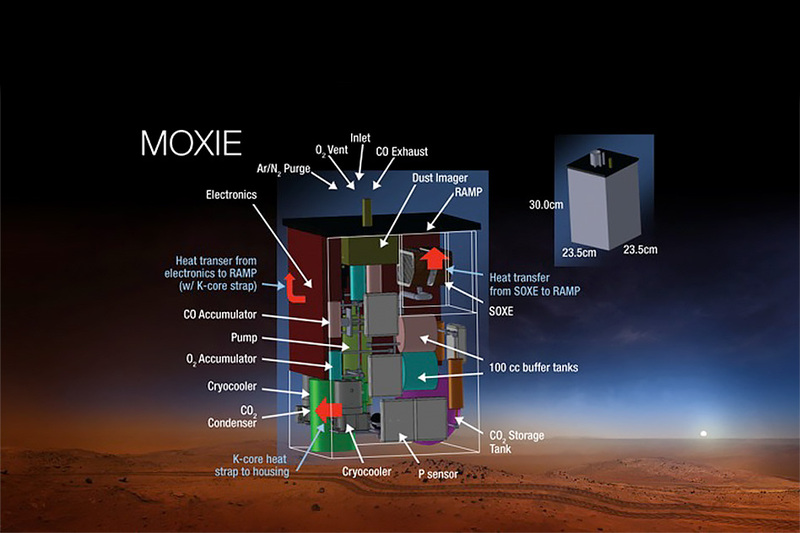 The Mars oxygen ISRU experiment (MOXIE) on the Mars 2020 rover. In Space forum. ​Hoffman, J. A., Rapp, D., & Hecht, M. (2015). 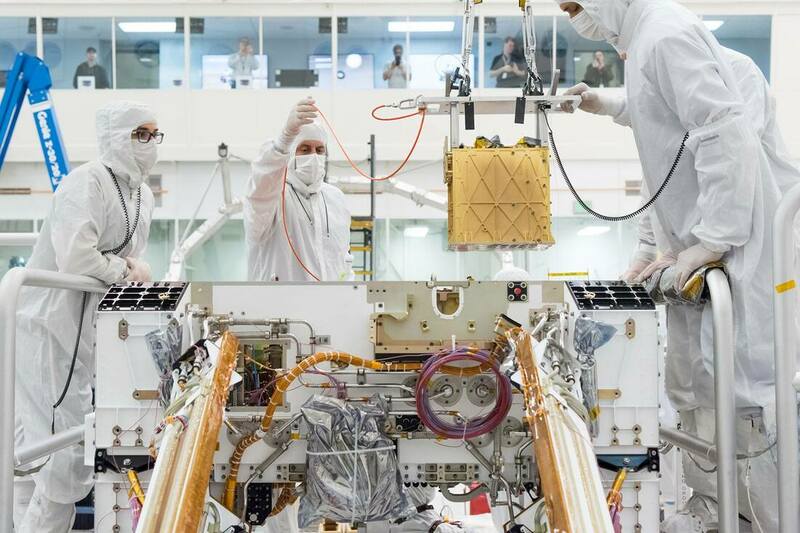 The Mars Oxygen ISRU Experiment (MOXIE) on the Mars 2020 Rover. In AIAA SPACE 2015 Conference and Exposition (p. 4561). Hartvigsen, J. J., Elangovan, S., Larsen, D., Elwell, J., Bokil, M., Frost, L. J., & Clark, L. M. (2015). Challenges of Solid Oxide Electrolysis for Production of Fuel and Oxygen from Mars Atmospheric CO2. ECS Transactions, 68(1), 3563-3583. ​Hecht, M. H., Hoffman, J., Rapp, D., Voecks, G., Lackner, K. S., Hartvigsen, J., ... & De La Torre Juarez, M. (2014, December). The Mars Oxygen ISRU Experiment (MOXIE) on the yet-to-be-named Mars 2020 Lander. In AGU Fall Meeting Abstracts. The experiment will be using a Solid Oxide Electrolyzer (SOXE) to split the carbon dioxide into oxygen and carbon monoxide. The oxygen produced will be stored for a period of time and analyzed for purity. Design challenges include, CO2 acquisition and pressurization, electrolyzing CO2, thermal issues, power consumption, guarding against failure, and creating a system that can survive a violent launch into outer space and an even more perilous entry through the Martian atmosphere. Future and past MOXIE outreach events. Ask us a question in person.